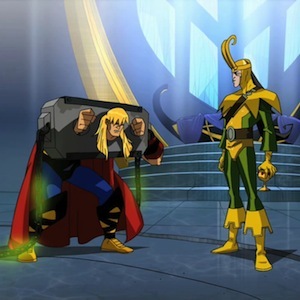 The arc of Season One of Earth’s Mightiest Heroes reaches a peak in the next-to-last episode as Loki reveals his master-plan sitting on the throne of Asgard, having claimed the power of All-Father Odin himself! Hawkeye’s everyman qualities set up the over-the-top Kirby elements of the Nine Worlds nicely. It’s easy for geeky comics readers (and gamers) to forget that plenty of guys have no idea about Norse mythology or who this “Loki” guy is. As far as Hawk is concerned, he’s just another world-conquering weirdo with a funny hat. Of course, as comics readers know, this story and the season’s arc are an homage to Avengers #1, where Loki’s machinations inadvertently led to the formation of the Avengers. Loki lays out his plan for the captured Thor in true arch-villain fashion. Meanwhile, the Avengers are scattered amongst the Nine Worlds, facing challenges of their own. This is another classic “split the team” scenario, with the encounters tailored to many of the heroes: Giant-Man in the land of the giants, Cap in the land of the dead, Iron Man in the kingdom of the dwarves, and so forth. The GM could be running these encounters in parallel, using quick “cuts” similar to the editing in the animation to shift from character to character. Alternately, these scenes could be handled through various kinds of solo play: perhaps the players themselves are describing what their characters encounter, or it’s a player-on-player setup where one player creates a suitable challenge for another (similar to “shadow play” from White Wolf’s Wraith). In one of my old superhero games, this stuff would have happened through “blue-booking” (in actual notebooks) although these days it could just as easily be texting around the game table. “And who are you…?” Ulik sets Stark up with the perfect straight line for his “I’m Iron Man” reply. Gamemasters: don’t be afraid to do this. Give players opportunities to show off of hit the bad guys back with some witty barbs or comments. Note that, in spite of the repulsor blast blowing Ulik across the cave and into the ceiling, the troll doesn’t show much effect from it for the rest of the scene. One of the valkyries accompanying Sif is, of course, Brunhilde, who became a member of the Defenders as Valkyrie. Speaking of straight lines, the set-up for “Hulk is the strongest there is!” is not only well-played, but a pivotal dramatic moment. Systems that incorporate some sort of bonus for tag-lines, battle-cries, or character descriptors (where “Strongest There Is” may even by one of Hulk’s game-rated traits) bring this nicely into play, making Hulk’s declaration more than just roleplaying, but something with a clear-cut game effect. Note how quickly the tide turns after Loki’s declaration of victory to Thor. In game terms, the scene shifts from one where the villains have the advantage to the heroes’ advantage. This could be an awarding of hero points or a similar resource for having sat through Loki’s monologue or just a pre-determined changes in scene “type”. For example, the Torg RPG (and its offspring, MasterBook) rated scenes as Standard or Dramatic. Heroes had an edge in Standard scenes but faced more challenges in Dramatic ones. Iron Man using the output of his mini arc-reactor to take down Ulik is classic power-stunt material and creative thinking. The loss of his remaining repulsor right before that (to say nothing of the loss of the rest of his armor) may have pumped Stark up with the necessary resources to pull the stunt off. On the other hand, in some systems, losing his armor is just the price Iron Man pays for getting it “on the cheap” as a device, focus, or what have you, and the player just has to think creatively when that “discount” comes home to roost and the GM takes away the armor and its advantages. What do these episodes teach us about superhero game design? The Long Game: Pulling off a master-plot like Loki’s is one-part planning (knowing that, eventually, the heroes will confront Loki after he has taken Odin’s power and begun conquering the Nine Worlds) and part opportunity. To quote Marvel’s Runaways, “A good GM lets players think they’re in control, even when they’re not.” Sometimes playing a master-villain or plotter who is supposed to be one step ahead of the heroes involves outright “cheating” and retroactive changes to the story. In a game context, the GM might have planned Loki’s master-stroke all along, but it could also have come about by fitting different things that happened in the game into a context after the fact, telling players they were “always” planned that way. That’s part of playing a master-villain well. Rising and Falling Action: Like most dramatic stories, superhero stories have periods of rising and falling action, where heroes face mounting challenges or difficult decisions, and then turning points where that tension is released, creating a “pause” or plateau before the tension begins to build and rise again towards the climax of the story. Some game systems build this dramatic arc into their mechanics, using things like the aforementioned Standard and Dramatic scenes, resource management, and the like. Opportunities for Awesomeness: A good game (and a good Gamemaster) should provide opportunities for the heroes to do awesome things (or even just “hey, that’s cool” things) since that’s a big part of the reason why many play RPGs in the first place. Still, a game system can only go so far in providing those opportunities; at least part of the process has to be a GM and group of players open to creating opportunities and encouraging and allowing fellow players to use them. This entry was posted in Game Design, Re:Animated and tagged avengers, game design, reanimated, rpg, superhero. Bookmark the permalink.